Last week I enjoyed a very pleasant holiday down in Devon. As usual on my trips down there, I went along to Rosemoor, an RHS botanical garden on the edge of Great Torrington. It was quite nice to go and see it in the middle of summer (even if the weather was decidedly unsummery), as most of my recent visits have been in the depths of winter. I noticed on this occasion there were far fewer sculptures on display but, as you would expect for the season, lots more flowers and things to be seen than on my winter excursions. As usual, I took quite a few photos (over 200, I think, this time – although many of them will be discarded at the editing stage). Unfortunately, however, I’m still working through my backlog of photos from my Rosemoor visit last Christmas Eve, which I want to finish before I get started on the new lot (I’ve already put up a few photos from other bits of my holiday, as well as a couple of other ones, on my Flickr account, though there’s more of those to follow too). I’m hoping to get through the rest of my Rosemoor Christmas photos fairly soon and I hope to be able to get all the new ones processed before next Christmas, when I’ll hopefully be visiting Rosemoor again. 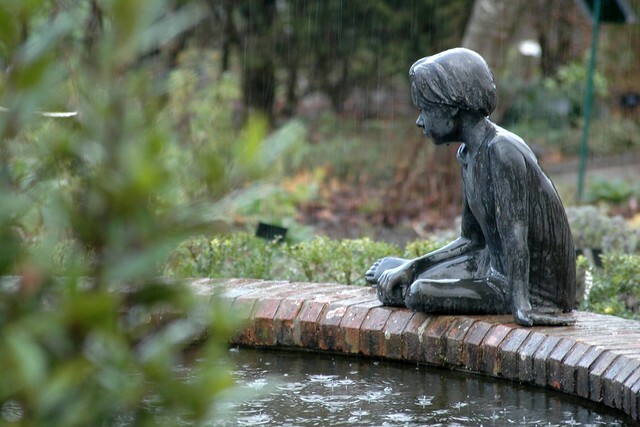 For now, I’ll leave you in the company of Julia, the statue of a girl sitting on the edge of a fishpond at Rosemoor. Although this is the official name of the sculpture (and presumably the name of the model), as I discovered a year or two back, I always tend to think of her as Rose, the not very original name I gave her soon after our first encounter (probably at least 10 years ago). Last Saturday I had my first trip into the mountains of Snowdonia for several months (in fact, the last one I can remember was back in January!). I went with a couple of friends to walk the Nantlle Ridge, which is on the Western fringe of Snowdonia. We started at the Rhyd-Ddu car park, which is also the starting point for one of the classic routes up Snowdon (not one that I’ve done yet) and walked through a boggy field before climbing up Y Garn, the first peak along the ridge (which runs along to the south of the Nantlle valley). This is one of several peaks called Y Garn, and I’m not sure what the name means – it’s not a word used in modern Welsh, except as a proper name. At 633 metres above sea level, it’s not an especially high peak but the starting point is just below 200 metres and it is quite a steep climb. It had been raining as we drove to the car park but the rain had more-or-less stopped by the time we started walking. However, the cloud was quite low and we were into it by the time we reached the top of Y Garn. 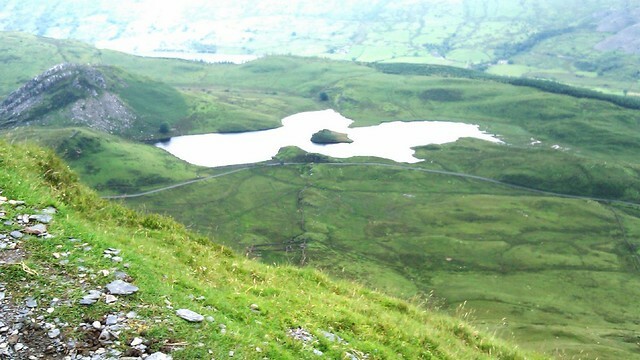 There were some nice views to be seen on the way up, though, including a lake called Llyn y Dywarchen. This was mentioned by Gerald of Wales (aka Giraldus Cambrensis or Gerallt Cymro) as having a floating island in the middle of it. Although there is still an island in the lake, it is apparently not the one that Gerald was talking about. More information about this legend can be found here. From Y Garn, we climbed up Clogwyn Marchnad, which required a bit of scrambling at some points, to the second peak, Mynydd Drws y Coed and from there it was a fairly straightforward walk to the third peak, Trum y Ddysgl. This was the highest point of our journey so far, at 709 metres. Unfortunately, due to the cloud cover and the fact that we didn’t stop to check the compass sufficiently early, we started coming down the wrong ridge and found ourselves heading south towards Moel Hebog instead of west towards Mynydd Tal-y-Mignedd, the next peak on the Nantlle Ridge. Once we realised our mistake, we decided instead of retracing our steps to cut round the edge of the mountain and then climb up a fairly steep, vegetation-covered slope to rejoin the ridge. This venture was successful although I think it was probably much harder work than just going back up the way we came. We eventually reached Mynydd Tal-y-Mignedd (only 653 metres above sea level, although you have to drop down much lower and climb back up even if you stay on the official route) and stopped there for lunch. Because we had been somewhat delayed by the detour (and I at least was consequently fairly knackered), the weather wasn’t great and we were due to be going to dinner with some other friends that evening and didn’t want to be too late, we decided to turn round at this point rather than carrying on to the end of the ridge. I was quite pleased with that decision as there was another very steep climb in store before the next peak (which is evidently nameless, though at the top of Craig Cwm Silyn, and weighing in at 734 metres). On our return journey we went back almost to the top of Trum y Ddysgl and then back down the ridge we’d accidentally descended earlier. Before too long, we turned off this and descended into the northern reaches of the Beddgelert Forest, from which it was a fairly gentle walk back to the car park. By the time we got back, it was turning quite sunny and so I persuaded my friends that it was worth dropping down to Beddgelert to check out the local ice cream parlour before we went home. This is one of the two best places in the world that I’ve so far found for ice cream (not that I’ve tried a very large proportion of them; the other one I particularly like is in Szeged, in the south of Hungary). Fortunately, the place lived up to my hype (it’s been several years since I last went there, so I had hoped it would still be as good as I remembered) and I enjoyed a cone of coffee ice cream, followed by one of chocolate and ginger (complete with big chunks of crystallised ginger), before returning home for a well-earned (and much-needed) shower. I hope to be able to go back one day, preferably when the weather’s a bit nicer, to do the whole Nantlle Ridge.